1 First put all the curry paste ingredients in a food processor and blend until smooth. Transfer to a saucepan over a medium heat and gently bring to the boil. 2 Add the sweetcorn, aubergine, courgettes and red pepper to the curry paste and bring back to the boil. Reduce the heat to low and simmer for 10-12 minutes, stirring frequently until the vegetables are cooked. 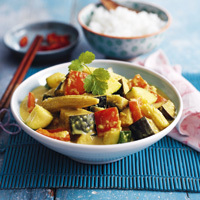 3 Garnish with the coriander sprigs and sliced chilli and serve hot, with boiled Thai fragrant or jasmine rice.